Before he runs out of time, Irish bon vivant MALACHY MCCOURT shares his views on death - sometimes hilarious and often poignant - and on what will or won't happen after his last breath is drawn.During the course of his life, Malachy McCourt practically invented the single's bar; was a pioneer in talk radio, a soap opera star, a best-selling author; a gold smuggler, a political activist, and a candidate for governor of the state of New York. It seems that the only two things he hasn't done are stick his head into a lion's mouth and die. Since he is allergic to cats, he decided to write about the great hereafter and answer the question on most minds: What's so great about it anyhow? 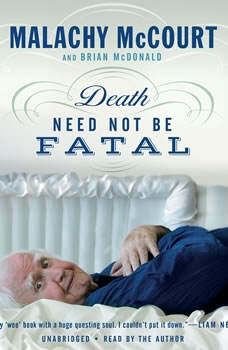 In Death Need Not Be Fatal, McCourt also trains a sober eye on the tragedies that have shaped his life: the deaths of his sister and twin brothers; the real story behind Angela's famous ashes; and a poignant account of the death of the man who left his mother, brothers, and him to nearly die in squalor. McCourt writes with deep emotion of the staggering losses of all three of his brothers, Frank, Mike, and Alphie. In his inimitable way, McCourt takes the grim reaper by the lapels and shakes the truth out of him. As he rides the final blocks on his Rascal scooter, he looks too at the prospect of his own demise with emotional clarity and insight. In this beautifully rendered memoir, McCourt shows us how to live life to its fullest, how to grow old without acting old, and how to die without regret.